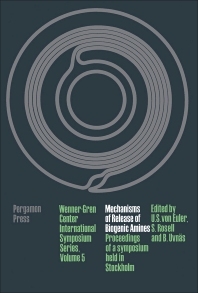 Wenner-Gren Center International Symposium Series, Volume 5: Mechanisms of Release of Biogenic Amines provides information pertinent to the fundamental aspects of the release of biogenic amines. This book discusses the physiology, biochemistry, and pharmacology of the biogenic amines. Organized into 39 chapters, this volume begins with an overview of the release of amines, which is implicated in functional disturbances characteristic of different diseases. This text then examines the concepts of cell structure that are significant to the release of neurohumoral agents. Other chapters consider the fluorescence reaction, which made it possible to work out a practical histochemical procedure. This book describes as well a few examples in which the monoaminergic transmitter is not revealed as a diffuse cytoplasmic fluorescence. The final chapter deals with acetylcholine as the only brain amine investigated, which could be influenced by the tremorgenic agents during the period of tremor. This book is a valuable resource for biochemists, morphologists, pharmacologists, and physiologists.